Both the president and a presidential candidate proposed legislation that would subsidize solar panels for low and moderate income citizens. The White House announced an initiative to increase access to solar energy for all Americans, especially those in low and moderate-income communities, while expanding opportunities to join the solar workforce. One key component of the initiative includes a goal to install 300 megawatts (MW) of renewable energy in federally subsidized housing, which is three times the administration's original goal. Additionally, Obama's proposal would create a National Community Solar Partnership to unlock access to solar power for the nearly 50% of households and businesses that are renters or that don't have adequate roof space to install solar panels. The partnership also includes issuing a guide to support states in developing community solar programs. 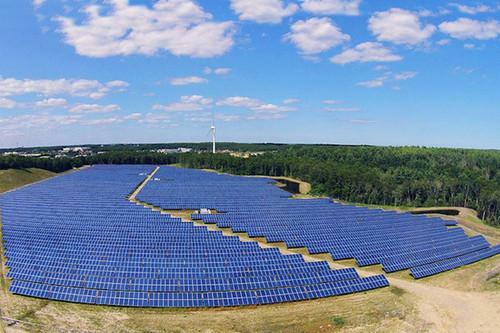 Community solar farms, which parse out clean energy to a group of shareholders, have emerged as the next largest solar market in the U.S., according to GTM Research. Over the next two years, community solar in the U.S. is poised to see its market size increase seven-fold, and by 2020 it will be expanding by half a billion watts annually, according to GTM. Community solar farms are already expected to grow 500% this year in the U.S.
Obama's initiative also calls for expanding solar energy education and opportunities for job training. The solar power industry created 31,000 new jobs last year, a growth rate that was 20 times the national average, according to the annual Solar Jobs Census. Since the first Solar Jobs Census in 2010, solar industry employment has grown by 86%. Sanders introduced the Low Income Solar Act (LISA), which would establish a $200 million loan and grant program through the U.S. Department of Energy to help with upfront costs of solar arrays on community facilities, public housing and low-income family homes. Renewable energy costs are expected to drop 40% in next few years, according to a report from the International Renewable Energy Agency (IRENA). Solar panel prices have dropped 75% since 2009, and those prices are expected to continue to fall. Residential solar PV systems are now as much as 70% cheaper to install than in 2008. From 2010 through the end of 2014, utility-scale solar PV costs dropped as much as 65%. Because of the decline in solar power costs, there are now 21.3 gigawatts of installed solar capacity in the U.S. - enough to power 4.3 million homes, Sanders said in a statement. The amount of solar power generated today is 20 times what it was when Obama took office in 2009. "It has never been cheaper to avoid dangerous climate change, create jobs, reduce fuel import bills and future-proof our energy system with renewables," Adnan Amin, director-general of IRENA, said earlier this year. However, many low-income families who would benefit the most from a reduction in their electricity bills are not taking advantage of solar because of a combined lack of access to financing options, as well as having homes with roofs that cannot support a solar panel, Sanders said. "While the cost of solar panels has gone down in recent years, it is still out of reach for millions of low-income families that need it the most," Sanders said. "Families across this country struggle to pay electricity bills and access to solar energy can help reduce these costs." The Low Income Solar Act would prioritize loans for woman- and minority-owned small businesses and set aside funding for developing solar arrays in Appalachia, Indian tribal lands and Alaskan native communities. According to Sanders, while low-income families are the hardest hit by rising utility prices, they are also the hardest hit by the impacts of climate change. According to the Bureau of Labor Statistics, the poor spend more than 60% of their income on basic necessities including electricity and food, compared to less than 45% for wealthy families. "The scientific community tells us very clearly if we're going to reverse climate change and the great dangers it poses for the planet we must move aggressively to transform our energy system away from fossil fuels to sustainable energy," Sanders said. "We can achieve this goal, save families money and protect the planet for future generations."